As simple as calling us at +34 952 234 916 or send an email to rentacar@marbesol.com. Confirmations will be made of the selected group. You may add in your comments when reserving the preferred model which we will consider based on availability. 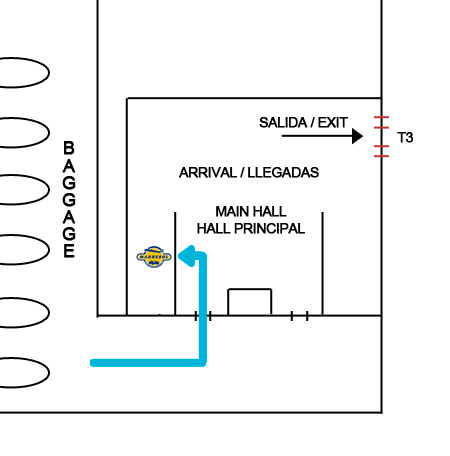 How do I pick up my rental car at Malaga's airport? We will be waiting for you in the main arrivals hall on your left, just past the first automatic door. Do not forget that our staff will always be fully uniformed and identified to avoid confusions with other companies. We will drive you from the airport to the Marbesol office which can take 3-5 minutes. Note that the minibus does not happen with a certain frecuency, so it is necessary to contact our staff in the main arrivals hall. 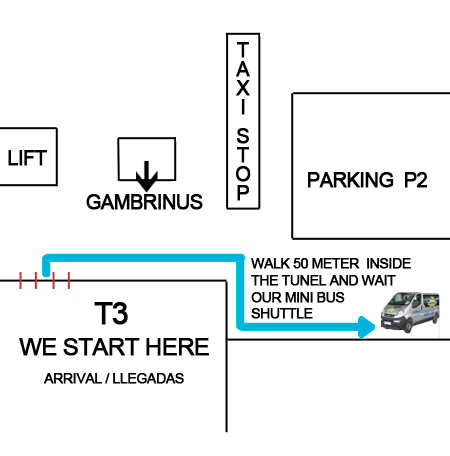 How to get to the shuttle bus stop: As you go out the arrivals main hall turn right. When you reach the taxi stop turn right again and go into the tunnel. Walk around 50 meters until you see a sign were you can read "Shuttle Bus". That is the stop were you have to wait for the minibus. If you have any difficulty finding us please call (0034) 952 234 916 or (0034) 687 740 019. How do I count the rental days? A hire day refers to a period of 24 hours from the start time of rental. There will be a grace period of two hours, after which they will be charged a full day rental. For how long can a car rental be? Each car will have a fixed term of at least one day and no more than thirty days. If you need the vehicle for a longer period you will have to contact the reservation department by telephone +34 952 234 916 or email rentacar@marbesol.com. What is the procedure for extending a lease? In case of continuation, before the end of its current lease, you should request for a confirmation in the reservation department +34 952 234 916 and go through a Marbesol offices to sign the new contract. If not, insurances will lose their validity and an extra will be charged a day in respect of late returns. Is it necessary to have a credit card? It is essential to be in possession of a valid credit card with the name of the holder of the lease. To remove the vehicle is necessary to show a credit card as a security for the rent (it will be necessary two credit cards in special and high-end vehicles). You can ask for it at the moment of giving back the car, once they have been paid all the extra charges associated with the rental, facilitating our staff the corresponding fiscal data. What if I have not received the confirmation email for my reservation? If your reservation has being done more than 24 hours ago and you have not received an email confirming it, probably it has been blocked by the anti-spam filter of your email. Check out if our e-mail is either in the "spam"or " trash mail" of your email. If so, configure your account so that your filter does not block emails from marbesol.com or rentacar@marbesol.com If the confirmation email is NOT in the spam folder, send us an email reporting the incidence to rentacar@marbesol.com or contact us at +34 952 234 916. Should I install the additional accessories myself? The person who rents the vehicle must install the additional accessories already hired because our insurance requires so. The reason is that if an incident occurs as a result of incorrect installation of accessories, the company is not liable for damages. Can leave Spain with the car? You are not allowed to leave with the car because our insurance has coverage only in Spain (take into account that Andorra and Gibraltar are excluded from the country). The driver must be the owner of the rental agreement who must present his/her driver's license at the time of picking up the vehicle. A second driver shall be permitted always providing his/her personal data to our staff, as well as driver's license.